Jacob Scarfone is a wide receiver currently playing. 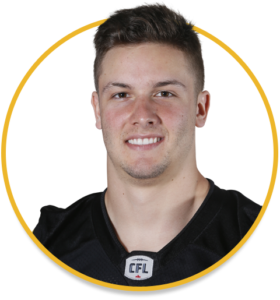 Selected by the Hamilton Tiger-Cats in the sixth round, 47th overall, in the 2017 CFL Draft. 2017: Selected by Hamilton in the sixth round, 47th overall, in the 2017 CFL Draft…Released July 31 so he could return to the University of Guelph for the U Sports 2017 season. College: Spent four years at Guelph University (2013-16)…Appeared in 29 career collegiate games for the Gryphons…Missed the entire 2016 season due to injury…Registered 109 receptions for 1,789 yards and 17 touchdowns over four seasons…Led the Gryphons in receiving in 2015, recording 57 receptions for 940 yards and 10 touchdowns, and in 2017 was en route to being named a U Sports Second Team All-Canadian. Personal: Born in London, Ontario…Majored in Economics and Finance at Guelph University…Attended St. Thomas Aquinas High School in London, Ontario.